Driving along a desolate stretch of paved road in southwest New Mexico, one would barely notice the dip in the highway. Traveling along at 65 miles per hour, it’s simple for one to only notice miles of open desert to each side. However, if one stops and takes a closer look at that sag in the road, you would quickly notice some very unusual characteristics are revealed. Upon investigating this dip, the first thing one realizes is that the depression is actually symmetrical oval that measures 25 feet by 15 feet. The asphalt is beyond a doubt, buckled along the circumference of the ellipse. 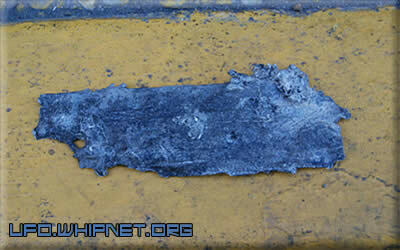 In additional, within this curious anomaly is a splattering of a silvery metal that is literally fused into the asphalt. Of particular note is that there are no signs that a vehicle fire took place either within the ellipse itself or the area immediately surrounding it. A package containing a flat strip of metal was by priority mail from Linda Howe postmarked July 25, 2005. 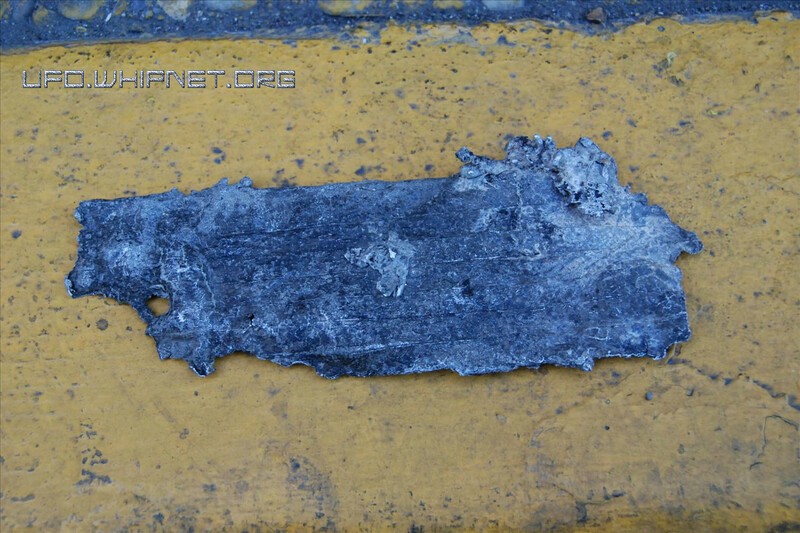 The metal was about 5.5 cm long, 5 cm wide with a thickness varying between 1 and 5 mm. The variability in thickness appeared related to being “fused” with folds and other fragments, probably from the same type of material. It was irregular in shape and appeared to have been exposed to high temperature. The impression is that it was originally part of a larger structure that had been involved in an explosion and/or high impact collision. It had a silvery-gray color and was relatively light weight (71 grams). One side was smoother than the other and had “stripes” that were 6-7 mm width running parallel with the length of the sample. The “stripes” were evident only as slight ribbon like “rises” (or indentations) of a fraction of a mm on the surface. The fragment showed no radioactivity above background, as measured with a Geiger counter, and it did not fluoresce when exposed to ultraviolet light. A small 5 x 11 mm piece was cut off the end of the sample using a hack-saw and examined for its elemental content using a scanning electron microscopy (SEM Hitachi S3200N). The SEM was configured for energy dispersive spectroscopy (EDS) and scans were done on the roughly and freshly cut surfaces. The freshly cut surface representing a cross-section showed a peak that was predominantly aluminum (Al) with a small “shoulder” in a position corresponding to magnesium (Mg) The latter appears to represent less than 2% that of the aluminum. Very low levels of carbon (C), oxygen (O), and silicon (Si) can also be seen. 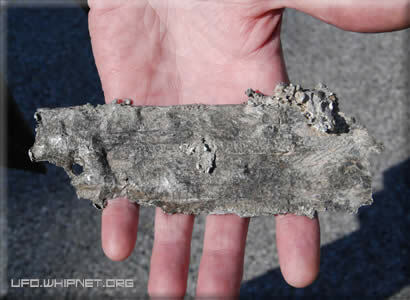 The rough surface also showed mainly aluminum but has significantly more magnesium, silicon, carbon and oxygen. Low levels of sodium (Na) sulfur (S), chlorine (Cl), potassium, (K) and calcium (Ca) are also detectable. An SEM photograph of the specimen shows both the rough surface and part of the cut surface (bright edge). Based on analysis of the cross-section, the metal fragment consists primarily of aluminum with a small amount of magnesium, silicon, carbon, and oxygen also present. The outer surface showed much higher amounts of magnesium, silicon, carbon, and oxygen. The latter four elements in addition to very low levels of a few other elements may represent contamination (dirt) and/or “charring/oxidation” that could have been in part associated with being at a very high temperature. An interesting feature of the metal is the presence of slightly raised, ribbon-like “stripes”, evident mainly on the smoother side. This should be clearly recognizable characteristics in ultimately identifying the nature and/or origin of the fragment, which is likely to have been part of a significantly larger structure. Pictures and information provided by Ken Lima. For more information please contact Ken at meteorlima@yahoo.com.